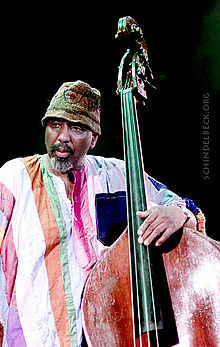 Weds., May 27 at 8 p.m.
Upright bassist William Parker, a germinal figure in the free jazz movement of the 1970's, will be in Erie at PACA, 1505 State St. on Wednesday, May 27 at 8:00 p.m. (Doors open at 7 P.m.) BYOB. Tickets $10. Parker was an active contributor in the revolutionary experimental free jazz scene in the 1970's. He achieved broad recognition playing with groundbreaking pianist Cecil Taylor, was a member of saxophonist David S. Ware's quartet, and played in Peter Brotzman's groups, and many others. He slipped from public view for a few years, though continued playing, and resurfaced in the 1990's, maintaining an active career in NYC and on tour since that time. Parker was one of the innovators in "extended techniques", finding new ways to make expressive sounds on his instrument, including active use bowing possibilities. Many of these have been picked up by other bassists and composers and have become part of the language of string bass music. He has published two books and appeared on many recordings. He will be heard at PACA with a trio led by drummer and composer Fredrico Ughi. Born and trained in Italy, Ughi migrated to London in 1994, then to NYC in 2006. He frequently appears and has recorded with the group he brings to Erie, which includes Parker, saxophonist/multi-instrumentalist Daniel Carter and Watson Jamison. Check out the clips below for a taste of the music you may expect. The first is a trio with Parker on bass, Carter on flute and Ughi on drums. The second is a duo with Ughi on drums and Carter on sax. The third is Parker alone in concert at Local 269 Bar. ADVISORY! You won't be able to hear much without headphones or a decent sound system on your computer.